Aiseesoft Data Recovery is a powerful and safe data recovery software. It can help you recover almost all deleted/lost files like photos, documents, emails, audio, videos and more from computer, hard drive, flash drive, memory card, digital camera, etc. Whether you lose data due to deletion, formatted partition, hard drive problem, RAW hard drive, crashed computer or other reasons, this file recovery software can always be your best choice. Mistakenly deleted important files? Lost data due to crashed computer? Whatever situation you are trapped in, this great data recovery software can help you get back the deleted, formatted or lost data with ease. This powerful data recovery tool can help you recover any data type like image, document, audio, video, email and more. Many reasons may cause the data loss on your computer, such as unexpectedly crashed software, computer crashed, wrong formatted drives, unexpectedly operations, partition deleted, virus attack, etc. Deleted Files Recovery: If you delete important data by mistake and empty the Recycle Bin, or "Shift + Delete" files, you can't get them back from Recycle Bin. Hard Drive Recovery: RAW hard drive, RAW partition, data system damage or partition loss, your files may be inaccessible, hidden or corrupt. Crashed PC Recovery: Windows operating system crashed and bootable problems, you will lose lots of files after reinstalling the Windows system. Partition Recovery: Disk accident, re-partition, improper clone, system re-installation, virus attack on hard drive and more will also make your data loss. This all-featured data recovery software enables you to scan and find deleted data according to the specific data type and hard disk drive. It is designed with a very useful "Filter" feature, which can help you easily find the lost data you need. Moreover, you are allowed to preview the detailed information of each data. Aiseesoft Data Recovery has the capability to quickly complete the data scanning process. It provides a "Deep Scan" feature to ensure you find all the deleted files. 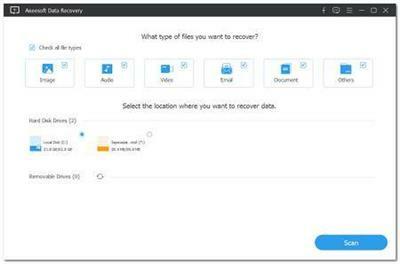 What's more, if you care about the safety of your important data, this file recovery tool can also be your first option. When you retrieve lost images, audio, videos, documents or emails, it won't store any of these data to its server. This reliable data recovery will guarantee the data safe.